DESCRIPTION ** 6 months free condo fee's ** Sun-drenched 3rd floor unit in the heart of popular Mission! The open-concept living space boasts 9-ft ceilings, 8-ft doors, and large windows throughout. The kitchen features maple cabinetry, white appliances, and sleek granite countertops including the large breakfast bar. The large dining area easily accommodates a full dining table and sides on to the living room with corner gas fireplace. The large balcony offers a good view, perfect for your morning coffee. The master bedroom has a walk-in closet and full 4-piece ensuite bath. Insuite laundry, insuite storage room, underground parking and more! 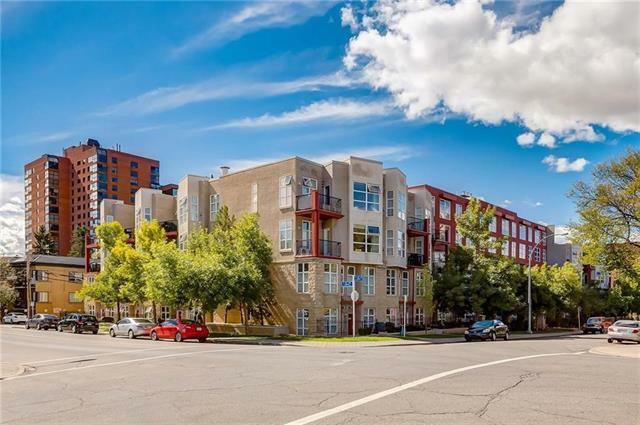 This condo is located within walking distance of the downtown core, and is surrounded by a plethora of shops and restaurants. 2 mins to the Elbow River park pathways and is a short walk to downtown. Home for sale at #307 303 19 AV Sw Calgary, Alberts T2S 0C9. Description: The home at #307 303 19 AV Sw Calgary, Alberta T2S 0C9 with the MLS® Number C4224623 is currently listed at $264,900.